Termites are particularly troublesome, because you may not realize you have a problem until significant damage is done. This occurs because Termites eat wood from the inside out. Our expert Inspectors are trained in spotting the indicators of a termite infestation and can develop a remediation plan for you. Termite inspections of your home are about 45 minutes 1 ½ hours long, based on the size and condition of the home and property. When possible, clutter should be removed. A comprehensive report detailing our findings will be presented to you once we are finished with our inspection. This report will include any remediation needed along with a cost estimate to complete. As the name suggests, Subterranean Termites come from the ground and establish colonies much like ants. These termites are the most common type in our area. They are creamy white in color, blind and without wings. They build mud tunnels or mud holes which allow them to travel in the soil to search for food. 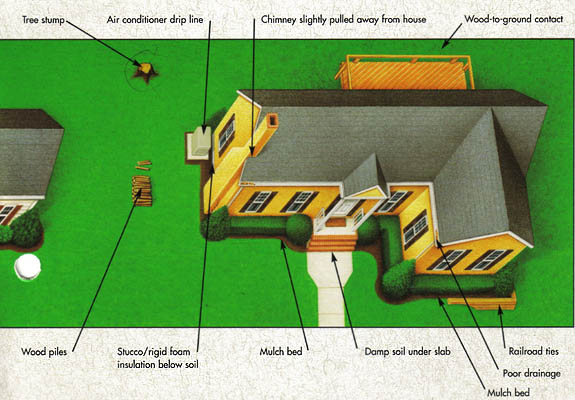 They enter structures generally at points where wood touches the ground and through cracks and holes in a structures foundation. However, they can also enter a structure through holes and cracks several feet above ground through the use of the mud holes. Dry-Wood Termites are less common than Subterranean Termites in our area and move differently as well. They have wings and fly into wood structures like window frames and doorframes. 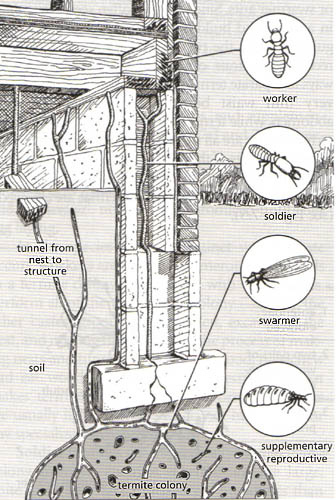 Dry-wood termites fly into structures and infest the wood directly. Although they are less common, Dry Wood Termites can cause significant damage. This damage occurs because they cut across the grain of wood, making the wood structure unstable. Indications of a possible infestation include, shed wings, and termite pellets.